This luxurious condo is part of the new "The Dawn by the Beach" Condominium complex. Wake up each morning to the view of the ocean from your bedroom window. Grab a cup of coffee in your granite/stainless steel full size kitchen and enjoy your coffee from the living room overlooking the lush green landscape, or head to your personal oceanfront patio to enjoy the Gulf of Mexico first hand. The rest of the day is your: head to the pool, beach, or take the kids to the Schlitterbahn Water park, Moody Gardens, the Historic Pleasure Pier or the Historic Downtown Strand. This condo has luxury from start to finish including large tile flooring throughout, granite counter tops in the kitchen and bath, stainless steel appliances, full size washer/dryer, Queen size sleeper sofa, private bedroom with large walk in closet, oceanfront location, private oceanfront patio, and 825 square feet of space. Located at 7000 Seawall Blvd., you enjoy the most convenient location. Just a quick right on the Seawall, from 61st street. You are a short walk or drive, to Restaurants, Wal-Mart, Starbucks, and many other shopping areas. The Beach is right across the street. Moody Gardens and Schlitterbahn Waterpark are a few miles away. Enjoy all that Galveston has to offer! The Dawn Condominiums is located 40 to 45 minutes drive from Hobby Airport and approx. 1 hour drive from Bush Intercontinental Airport. Feel free to call me if you have any questions or concerns during your stay at the Dawn216. Nam is a pleasure to deal with. Booking was easy, she is very prompt and willing to answer questions. The condo itself is lovely! Clean, well-kept, with comfortable beds (even the sofa bed is comfortable), modern features, and an incredible view. Stocked with essentials and things easily forgotten at home! The little yard is perfect for my small dog. Wonderful location, near a grocery store and of course, right across from the beach. Part of a nice complex with pools, grills, and a fitness center. This was our second stay at the Dawn216, and we've enjoyed it so much that we are hoping to make a tradition out of it. We have visited Galveston for years but this condo is now our favorite place to stay! I stayed in The Dawn #216. It was a very nice, clean, well kept condo. The owner was very friendly to deal with also. There were 3 of us (2 adults, 1 child) so the size of the condo was perfect for us. It had all the basic necessities (i.e. pots, pans, plates, silverware, towels, etc). The condo looks out into a small yard area and then if you looked a bit further (across the street) you have a nice view of the beach/ocean. The complex has a nice pool and workout center you can use. 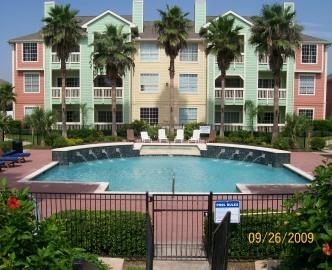 It is located in a great area w/easy access to all the fun attractions and beaches in Galveston. I would highly recommend staying in the unit. This was, by far, our best stay in Galveston. Clean, conveniently located and very easy reservation process. Would stay here again. Also great garden level access for our small dog. Two pools nearby and grills for cooking within 2 minute walk. Owner's reply: Thank you Jares for your thoughtful review. I really appreciate it. Looking forward to hearing from you in future! Owner's reply: Thank you Dominique for staying at the Dawn216. Looking forward to hear from again soon! We were very impressed with the looks and up keeping of our condo at The Dawn by the Beach in Galveston. There were so many extras provided for us that came in handy every day (silverware, paper towels, dishes, cooking utensils, etc.). The condo landscaping was absolutely beautiful and being worked on by groundskeepers almost daily. The pools were beautiful and a great option to choose from the smaller pool that was more deep water or the much larger pool that had more shallow parts. The sleep arrangement was perfect for our family and easily fit a family of 4-5! When we come back, we will stay in this same condo for sure. The condo was in the perfect location and had fantastic views of the ocean. We were able to sit on the patio and listen to the sound of the waves rolling in. It was great! The condo was very clean and upgraded. We will definitely stay there again. Thanks!! Great location, loved the modern features, has a washer and dryer, coffee maker, and we had an awesome time. Don't count on the sofa bed to be comfortable to actually sleep on it, but there are two twin bed mattresses in the closet that we used for our kids. The owner is very wonderful to work with. We will be back. We rented this amazing condo for the week and we were so happy to find such a great place. Upscale condo with high end appliances.2 beautiful pools. We woke up every morning to a direct view of the seawall . Both the condo and the complex were clean and made leaving even more difficult. And we can't say enough positive things about renting from Nam .she made sure that we had everything we needed before we arrived . We will return to Galveston and to this rental in the future! My family and I stayed at this condo for 5 days, and really enjoyed it. Being a condo, we packed pretty heavily to say the least. My expectations were exceeded, it was spacious and comfortable for a family of 5 for a short stay. The condo supplied things I forgot (or would have never thought to bring in the first place), like oven-mitts. The condo itself is tastefully decorated and arranged, like a really homey hotel. The patio gate can open up to a lush communal lawn enclosure. My kids really enjoyed playing out there with our shih tzu. We had planned on staying in Kemah, but decided at the last minute to stay in galveston. We are so glad we did. We will definitely stay here again. Thank you!! We traveled to Galveston for a short Vacation I book this unit online. The unit was very clean, we had no problems with any any of the accommodation's. The units are close to all attractions Galveston has to offer. A very nice place to stay. Thank You we will be back.